A while ago a friend made a delicious cake which I think she called Cinnamon Streusel. It was a cake batter with cinnamon flavour sugar swirled through the mixture which was then topped with drizzled glace icing – it may have had some nuts in as well. I begged the recipe (of course!) but sadly it could not be found. She thought it might have come from a Waitrose magazine or leaflet but I have been unable to track it down (any ideas on this gratefully received). In spite of much searching drew a blank with finding a recipe that looked like the cake I ate. 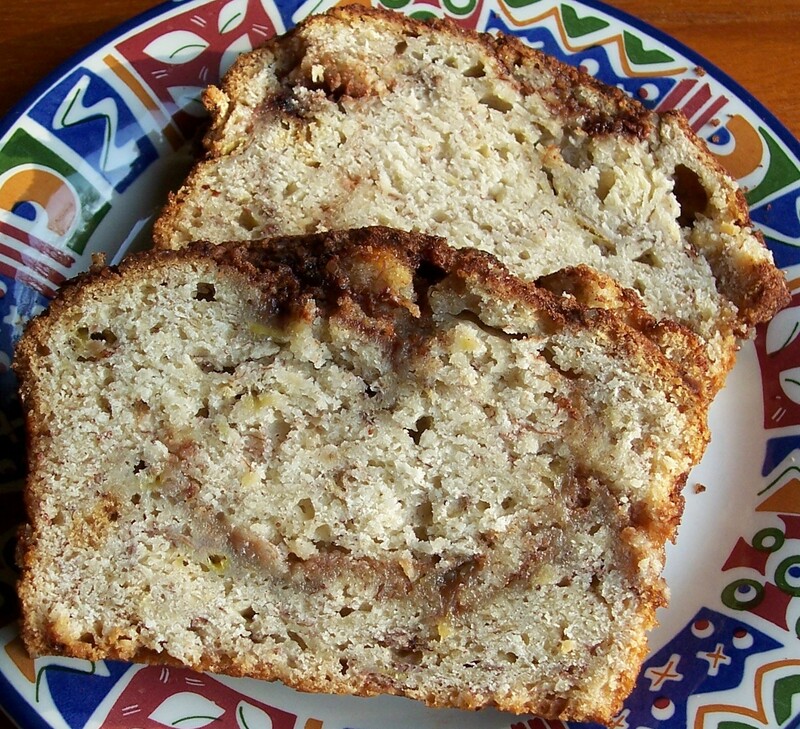 One recipe I found, which was somewhat similar, was this variation on Banana Bread. My usual recipe, to which I sometimes add walnuts, is OK but this sounded so much better. The other plus is that it’s a great way of using up those soft bananas that have hung around in the fruit bowl a bit too long! The original recipe, Cinnamon Swirl Banana Bread, was a colleague’s recipe posted by Pippy on a message board back in 2005. The recipe was in cups but I have converted it to metric and imperial. I used four very ripe medium sized bananas (the unpeeled weight was just over 1lb). For the crunchy texture I knew it would give to the topping, I substituted demerara in place of white sugar. The finished article was dense and much more of a cake, so I changed the title. The cinnamon sugar amount is rather generous and the sugar, but not the cinnamon, probably needs reducing, perhaps by a third. For a less strong cinnamon flavour reduce the quantity of the spice in the topping mix. This recipe gets positive feedback on the message board with one respondent renaming it ‘Cinnamon Smile Banana Bread’ because of the ‘U’ shape in the middle: as you can see mine is smiling too! 1. Preheat oven to 170oC/325oF/Gas 3. Butter and line a 2lb loaf tin. 2. Mash the bananas and mix together with the melted butter, white sugar, egg, and vanilla. 3. Sprinkle the baking powder, bicarbonate of soda and salt onto the banana mixture and stir in. 4. Gently fold in flour without over mixing. 5. Mix the demerara sugar and cinnamon together. 6. Spoon half of the cake mixture into the loaf pan. Sprinkle over about half of the cinnamon sugar. Spoon over the rest of the batter and finally sprinkle the remaining cinnamon sugar on top. 7. Bake for 50-60 minutes until browned. 8. The original recipe suggests the addition of extra ingredients such as milk or dark chocolate chips or chopped nuts at the same time as the flour. Other ideas would be crystallised ginger chunks, glace cherries, dried dates or dried apricot. I would certainly try it with walnuts which we always enjoyed when I made my original Banana Bread recipe. Love the smiling cinnamon in there! I would certainly smile, too, with a cake like this! Yours looks so moist and with that topping…. hmm. Thank you and welcome Kim: It was as yummy as it looks. A little warning about adding chocolate to a recipe that did not originally contain any: I have just had problems with adapting my Whole Orange Cake recipe into Chocolate Lime Cake and am not quite sure why. It may be that I just added too many and upset the balance of ingredients, so I suggest you just add a few to start with. You may be more experienced in these things, of course and I would welcome any thoughts on the subject!